As mentioned previously, my goal for the weekend was to show four of my good friends around Seattle, along with two of their children- one six months old, and the other just over two months. My original itinerary was scrapped early on, because of the flooding that shut down I-5 and delayed my friends in Portland for a day or so. But with six adults and two children on different schedules and with different interests, the only plan I had originally was to be as flexible as possible, and with the transportation difficulties, that’s really all I could do. In the end, we got Pike Place Market, good coffee (and cool coffee art! ), the Troll and, most importantly, we satisfied a Jimmy John’s craving. You never know what your guests will enjoy the most, and sometimes it will surprise you, but if you’re flexible, even Jimmy John’s can be a memorable highlight. My best friend, who had the two-month-old, got in a day before my friends from Portland. She had been here before, and wanted to try Seattle coffeeshops. So, we ate lunch at Ivar’s, and then headed to Zeitgeist, where the barista was kind enough not to get snobby with our touristy request for ‘cool coffee art.’ I had dreaded the question, and in different establishments, I suspect we may have gotten ‘crappy coffee art’ instead, but Zeitgeist’s barista impressed me with his small kindness. 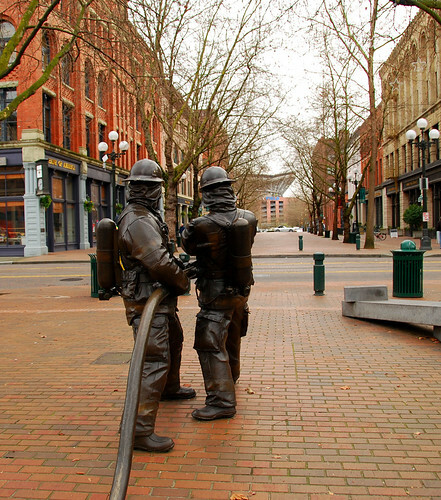 It was chilly, so we didn’t spend long outdoors in Pioneer Square, but long enough to enjoy the statues, particularly the Fallen Firefighter’s Memorial, pictured above. We then stopped in at the Seattle portion of the Klondike Gold Rush National Historic Park right across the street, which is a free museum dedicated to Seattle’s role in the 1890’s gold rush to the Yukon. It was a spur-of-the-moment decision to stop in there, but one of the best I’ve made while showing people around Seattle. The staff were friendly, the seats in the movie theater were comfortable for two tired travelers, and there were enough private areas for my friend to tend to her child’s needs. By Saturday morning, the Portland contingent had arrived- three more adults and the six-month-old. Though a few of them had visited Pike Place Market before, others hadn’t, and it’s always an enjoyable visit, even for us seasoned Seattleites. We had croissants at Le Panier, bought food and trinkets in the market, and finally began to get hungry. Now, normally I would take visitors to some lovely seaside restaurant near the market- Lowell’s or Etta’s, perhaps Cutter’s Bayhouse. But our guests were all originally from my hometown, which also happens to be the headquarters of Jimmy John’s. The Oregon folks had been craving Jimmy John’s subs since they moved out here a year ago, but hadn’t ever ventured far enough north to satisfy their needs… so we skipped the seafood and went straight to sandwiches. That evening, after a long, restful afternoon tending to baby naptimes and food times, we finally got enough juice again to drive up to Cal Anderson park for a very brief visit, and then head over to Zoka for another coffee shop stop. Yes, I realize I could have gone to Vivace or Bauhaus or any of the other Capitol Hill establishments, but have you ever tried finding parking up there for two cars on a Saturday night? Tangletown is slightly easier to navigate in terms of parking, at least.